It’s Christmas Eve, and I’m balanced on a stool, my back against the freshly-sprung bar in my parents living room, facing outwards. A carousel of gifts circles the room, and soon, my younger sister presents me with a thin, neatly wrapped rectangle, roughly two feet by a foot. It’s light, and rests weightlessly on my lap, though I try not to consider the contents of the parcel, since eagerness and ugliness intertwine in the adult practice of gift-giving. Eventually, I’m called upon, and shed the paper from the bottom left corner, revealing a black, wooden frame that hugs a black and white picture. While still mostly shrouded by wrapping paper, I pause, vocalize approval, and look up. Kelly and I exchange a knowing glance. I grip the sides of the frame and scan the familiar photo, which is oddly unfamiliar now that it’s larger than my phone screen. Then, I reverse the gift towards patient onlookers, who meet it with universal praise, even though—through no fault of their own—they’ll never fully understand it. They weren’t there, and even if they were, they wouldn’t have been there in the same way we were. Frozen inside the frame, Wesley Schultz is on one foot, head down, reflected on a glossy, black stage. His face is obscured by a mane of dirty blonde hair, as he furiously strums his guitar, about to bring a heavy foot to the floor. Next to him, Jeremiah Fraites is bent at the waist, suspenders reaching across his back, mirroring Wesley’s guitar with a mandolin, his boot paused on a foot pedal that’s a moment from being sent towards the bass drum at the center of the stage. The same bass drum that’s at the center of the sound, inaudibly alive, whenever I revisit the stationary energy that’s now hanging on my wall. At the base of the stage, Kelly and I are front row, in the corner of the crowd, looking lost and found in the same breath: our faces are unencumbered by our parents’ former, skeptical questions—You spent how much?—and our brows are untroubled by the thought of having to cover September’s student loans. I look at us, and there is freedom there. Stage right, my hat is backwards, and I lean over the guardrail, looking on in joyous study. Kelly is next to me, beer in hand, her excitement leading her a few feet closer to the band. Her head is slightly back, and a permanent smile wraps her face. Kelly’s entire life, her cherub cheeks have kept her forever young, but that seems even more true in this moment. Behind us, the crowd extends endlessly backwards: it disappears into the shadows, and looking at the picture now—it sits above my desk, the patron saint of this account—I remember the weight of the audience on my back, but how that feeling was soon shed, and how we were entirely separate from the crowd of thousands. September has a unique charm, and that night, an early fall breeze sweeps in from Boston Harbor, the mild afternoon giving way to a mild evening. A gentle wind tussles the tops of patrons’ heads, as they move from bars to balconies to restaurants to the venue. Inside the Blue Hills Bank Pavilion, stage lights glow against the setting sun, making the season’s shortened days noticeable for the first time. Soon, the lights fade entirely, and darkness takes the unsuspecting city. Out of the blackness, vague but familiar silhouettes emerge, slinking out towards vague but familiar places, catching the crowd between screams and bated breath. With Boston suspended in the background, a well-worn boot finds its counterpart, and a kick drum hangs in the air like a gun shot. It casts away the last moment of anonymity, and is met by a hollow-bodied C chord, which echoes across the harbor, making the night small, then infinite, below its sound. Bay lights flash, punctuating “Sleep on the Floor,” and the Lumineers are now visible. It’s the first time the Lumineers have played Massachusetts in years, and “Sleep” is an appropriate reintroduction: it’s infectious, anthemic, and sweeping—the sound of that point on the horizon where open road meets endless sky—and below Wesley Shultz’s everyman croon, there’s agelessness, which reverberates over the crowd. Like something elusive is finally within reach. Something out of focus becomes suddenly tangible. And inside, there’s the echo of a collective whisper, saying, This is big, and this is possible. During the song’s breakdown, Wesley’s free-spinning vocals crash against the stomp of the bass drum and the roll of a snare, the crowd revolving on a tambourine axis, and finding the shared heartbeat in the steady pounding of heavy feet. “Sleep” sets a trajectory towards an elusive fountain of youth, for which all great music aspires, lying in the ephemeral space between poetry and backdrop. Under that type of sound, you give up everything else, give up part of yourself, which happens in “Sleep,” a song that is internalized more than understood. It’s the type of song fans take ownership of, recognizing themselves in its everyday vignettes, finding themselves in its borderless imagery, and living fully between those moments that have long since passed, and the moments that have yet to arrive. So on a Thursday in Boston, people sing “Sleep On the Floor” like they’d written it, like the familiar words had fallen out of their pens, as one imagines happens on any given night, in any given city. But I’m at the foot of the stage on this night, in this city, where the music hits me in the chest and lives momentarily in my bones, before extending out to the masses. And I’m singing “Sleep” like I’d written it, and my little sister is next to me, elated, singing “Sleep” like she’d written it, and when I walk through my office and see the two people in the corner, captured inside the frame, they can’t be convinced otherwise. In the current landscape of fandom, “importance” and “favor” run more closely together than ever before—first, because they have to, and second, because they should. Though it’s been said before, it bears repeating here: there will never, and can never be, another Beatles. The systems that feed and inform our culture have simply changed too drastically, and the former avenues for the dissemination of music have long since eroded. The days of cultural gatekeepers selectively shaping sound are over: there is no more singular influence of regional radio, no newsstand validation, no appointment appearance on late night TV. The Goliaths that once ruled the day have died off, and now, a generation of David’s have taken the city, busking on its sidewalks, and carving out their piece of the leftover. In this brave, new world, there’s the internet, and there’s choice, and if music was once a kingdom united, it’s now a fiefdom, where the fields of fandom have been divided and sub-divided, and yeomen harvest individual crops, grown on the locality of personal taste. It’s a playlist generation, which has resulted in less shared experience and less of the common language that music provides. I suppose, in one way, it’s sort of sad that we’ve lost that larger community, no longer wrapping ourselves in common anthems, or stumbling upon the charm of those moments where everyone, everywhere, knows the words. But that’s likely where the sadness stops, as it’s far outweighed by the beauty of autonomy, and the ability to constantly discover and rediscover. It’s outweighed by the diversity of acts, the breadth of talent, the proximity to the stage, the immediacy of records, the crossover of sounds, the indies and the locals, and the regionals and the nationals. Now, your heroes can stay yours, because the music worth listening to can run unimpeded, unfiltered, and unbastardized. Now, we have access to any sound, anytime, anywhere, and if what you find doesn’t suit you, keep searching, because what you’re looking for exists, and if it doesn’t, you’re allowed to make it, and it’s allowed to be heard. Which leads me to the thought that, in this era, there’s a different relationship to “favorite band” than ever before. Of course, the overriding factor, as it’s always been, is quality. 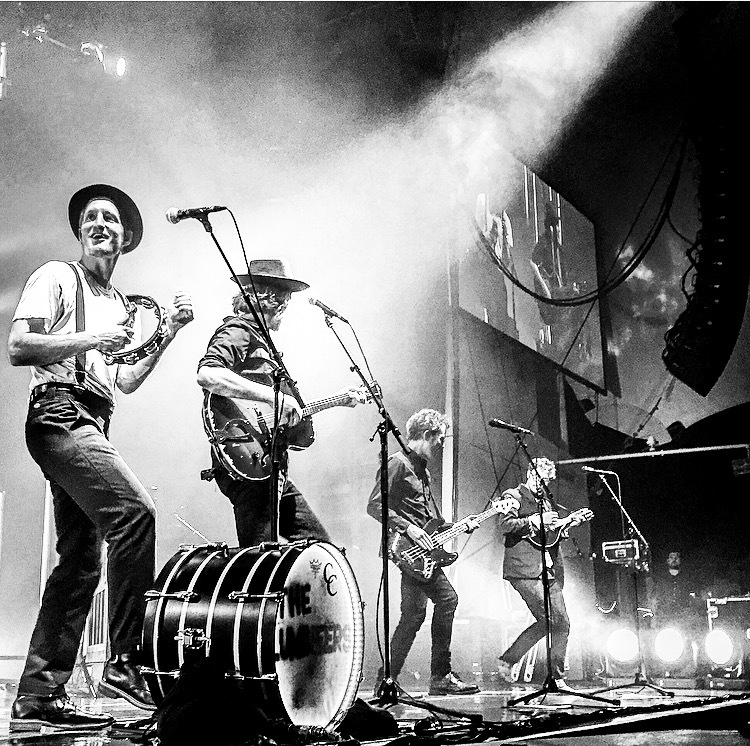 If I’m to call the Lumineers my favorite band, I can explain my favor practically, pragmatically, intelligibly. The reasons exist, the most obvious of which—to borrow a phrase—is “modern nostalgia”: songs that are new, but feel like they should’ve always been. The Lumineers harness that better than anyone, making timeless music in the present, for the present, but which could fit in any era. Look no further than “Ho Hey,” which became unavoidable, and weaved a world into four chords, foot stomps, and distant shouts: judging by the way it resonated at the time, and the way it continues to resonate now, it’s something people thirst for. Even as it plays in perpetual motion at the never-ending weddings of my late-20’s, I am not sick of “Ho Hey,” still play it, still sing it, and can’t imagine a time when it reaches an exportation date. The Lumineers’ self-titled album is lined with that kind of agelessness—“Flowers in Your Hair,” “Dead Sea,” “Submarines,” “Big Parade” “Classy Girls,” “Charlie Boy,” “Stubborn Love”—and though Cleopatra is a sonic step forward, modern nostalgia remains inherent, can’t help but seep in, most obviously with “Gun Song,” “Gale’s Song,” and “Ophelia.” That comes from the Lumineers’ musicianship, the way they get the most out of a sound that’s rustic and sweeping; it’s a credit to their ability to assemble albums, as The Lumineers was a weatherable sole offering, which filled a space for four years, an eternity in the modern-day race to remain relevant. The Lumineers, as with its successor, is crafted, has countless doors through which to enter and re-enter, each time allowing some new charm to be found. I returned to The Lumineers more often than any other album thus far in the twenty-tens, which is a relationship that feels like a relic of a bygone era, a return to the way people used to listen to music. Maybe it’s due to the nearly half-decade wait for its arrival, but Cleopatra feels even more complete an album, with a deeper interplay between its songs and a larger scope to its narrative. It’s certainly more electric than its predecessor, but is still built on the type of songwriting that made the band attractive in the first place, grounding itself in the obvious chemistry between Jeremiah’s arrangements and Wesley’s lyricism. When it was released, I thought of Cleopatra as roving American Literature, existing for any time or place, and I still feel that way. There’s something of Kerouac in it, with a wanderer’s focus and poetic prose, which was even more undeniable in the threaded music videos that followed: the release of “Cleopatra,” “Angela,” and “Sleep On the Floor” felt live events, as the Lumineers gave a floor-to-ceiling vision for their record, pulling out another strand of the story in an alternate medium. It expanded listeners’ understanding, brought new life to familiar characters, refreshed the importance of the music video, and suggests that the modern album is not dead, just shifting: an album of substance will always be greater than the sum of its parts. The quantity of the Lumineers’ quality continues (I’ll rest my case momentarily), and comes to include songs that evade cliché at every turn, subjects beyond love and loss, Wesley’s empathy as a writer, the sweetness of Neyla Perkarek’s backing vocals, her even-sweeter cello melodies, the energy of their live performance, the feeling a bass drum shakes loose, and the way their sound transports, how it can be reproduced anywhere, at a moment’s notice, without losing its soul. That is quality. Quality supersedes everything else, and exists in the Lumineers. But my argument is that a “favorite band” extends beyond the critical evaluation of quality, and is colored by favor, for the simple reason that, among all the myriad options, it’s that band and those songs that, for whatever reason, have risen above the noise, and hit us in the heart. “Favorite band” is tied more directly than ever before to those moments that quality leads us to, which is how and why we take ownership of music. Our favorite bands become more uniquely our own today, because no one knows them quite as well as we do, because despite the “share” buttons, we don’t share music in the same way our parents did: we don’t wait together for the release of the next Beatles, the next Eagles, the next U2 album. We dig into what suits us personally, what suits our moments, not what suits our generation. In the modern day, 500,000 people will never again turn out for a single-artist concert in Central Park. That was left in 1981; this is 2017, where an unknowing photo was snapped of my sister and I, two in a crowd of some 5,000 that turned up to watch a Grammy-nominated, platinum-selling, national-touring act. Where Stephen Kellogg walked unplugged up the stairs of the Iron Horse in Northampton, and looked his fans in the eyes, smiling at the people who knew his words as thoroughly as he did. Where Frank Turner returned my e-mail, and thanked me for, four years after the fact, writing positively about an album that he felt had been misunderstood at the time of its release. Where Bruce Springsteen is still untouchable, and should be, but I loved his autobiography. And it’s okay that it’s different now, and it’s good that it’s different now, because you get a say, and you tailor your music to you, and you’re able to build a relationship to someone’s work, where previously, you were left in the nosebleeds, a distant dot in the arena, kept at arm’s length. Of course, people have always bound themselves to the music they love, but what I like about the modern landscape—with its choices, its sub-cultures, its splinter groups—is the way it binds us to the people who “get it,” who we share it with, and the times we’ve shared it with them. Once upon a time, there was a common language, but now there are regional dialects, which don’t always translate, so when we find someone who understands, we’re home. The analogy is this: last March, I was in a sports bar in Ireland, at a table with four Paddies, and an American I’d never met before. The American lived there, and asked the bartender to put on the NCAA Basketball Tournament, instead of Premier League Soccer and local sporting news. The bartender obliged, giving up a very small TV in a very small corner, and the American and I watched intently, had a conversation over something uniquely our own, with its own lingo and nuance, while those around us didn’t even understand the rules to the game. I run out of the pit and give Tim my photo pass, because he’d come with me, and lied his way to the foot of the stage; and he and I are in Europe, fifteen yards from Noel Gallagher, then spill into a late night bar with an Oasis-only soundtrack, arriving home well after we’d planned; the Parlor Room’s cleared dance floor, Greener and I and the Hanna’s and the Hanna’s boxed wine, and Lake Street Dive peddling a sound too big for the room; the first SK meet up, and Kelly and I are still sitting on the arm of that couch whenever I hear “In Front of the World”; the girl it was never going to work out with, and how things were already falling apart, but John Mayer played “Boys of Summer” in late August, and no one can ever really take that away; Kenny Chesney, out in the Days Inn parking lot, and Kate is there, and Sarah is there, and there was never a summer that was quite so free; lost on a Cape highway, a novice to being stoned, the windows of Matt’s truck open to sea-salted air, while “When the World Ends” ebbed and flowed through us, via dingy speakers. Fenway Park, 2003. The Rising Summer Tour, the feeling that my aunt and my dad were letting me in on a long-held family secret—and how nothing was ever the same after that. There’s a bar on Route 20 in Wilbraham, Massachusetts called the Daily Pint, formerly Houligans, and on Sunday nights, I sit around there with friends and acoustic guitars, strumming away whatever’s left of the weekend. The years have seen a revolving door of players, the cast of characters having turned over a few times, with only two people stretching from the beginning until now: myself, and Zack. Zack is a banjo-playing, harmonica-toting bartender, who strums and sings from behind three feet of wood, halting drink orders if he’s mid-song, and halting songs if he’s mid-drink order. Zack and I went to school together, and I always liked Zack, and I think he always liked me, but we didn’t run in the same circles back then. Now, I could set my watch to him, and him to me. I’m usually the first one in the door on Sunday nights, a touch after 7 o’clock, and Zack and I cover the week that’s passed, tune up, and cover the week to come. He gets me an ice water while my Guinness settles, and is still working on getting the perfect shamrock in the head of the beer. It’s a simple ritual, but a consistent ritual, and now that I’m taking inventory of the last few years, I’ve come to think of Zack and I like characters from The Sandlot. Houligans’ Benny and Smalls: the tentpoles that keep the game going, while our teammates have moved on, faded, and disappeared. As a rule, Houligans was empty on Sunday nights, and despite its facelift, the Daily Pint often still is, so we took the bar as our own once, and haven’t given it back since. It began one night after a men’s league basketball game, but the specifics aren’t as important as the fact that it’s still going, despite the changing patterns of life that take place between your early-20’s to your late-20’s. At the moment, the band (which feels like too complimentary a word) is more talented than it’s ever been, with Zack and I joined by Ryan, a good-humored, technically-proficient guitar player with a mature-ear, and Nick, a new father and consummate bass player, whose selfless fills and subtle grooves are increasingly unsurprising the longer I know him. The four of us have been the standard lineup for about a year, a year-and-a-half, and in terms of pure music, it’s the most fun I’ve ever had playing, the most growth I’ve experienced in years, as I’m forced to my high-end simply to keep up with their collective skillsets. It’s taught me how to listen, how to fit in, when to stand out, and what playing “together” actually means. But when we were a little younger, and a little drunker, and stayed up a little later, and lived with a little more abandon, and had a little more fire, and played a lot worse, Sundays were something else. My salad days, when there was some of that Wild West in all of us. If anything’s missing in this current iteration, it’s that. But that absence is no one’s fault, other than time’s. Before its renovation and name change, Houligans wasn’t so much a bar as a place to drink that wasn’t your house: it was small, with low ceilings, and could comfortably hold some twenty-five or thirty people, but capacity was never a concern. There was a kitchen in the back, which was mostly wasted space, since their menu consisted of chips, nuts, microwavable popcorn, and Elio’s Pizza’s. The oven—through some wiring mishap—seemed connected to the bar’s stereo, and would buzz violently above the jukebox when the timer went off. There was a fairly liberal “serve yourself” policy, if Zack was playing a tune, and a select few of us were allowed behind the bar to pour beers, but we maintained an honor system, marking down drinks on our own tabs. Once, I saw a dog sitting on a barstool, and another time, a non-Zack bartender turned the sound off a basketball game, so he could watch “Ghost Hunters” on another TV. I saw a 14-passenger mini-bus pull up on a Tuesday night and nearly eclipse the place, and on summer Sundays, we would congregate out on the patio until mosquitoes forced us inside; even after, we’d keep the doors open (only partly due to faulty HVAC), and let the lines between outside and in blur, as an ever-later breeze swept by us, from one door to the other and out into the parking lot. It was in this place that Zack and I stumbled onto something mutually understood, onto our shared tastes and our common language. Somehow, that grew into a musical island of misfit toys, as odds and ends trickled in slowly. Very slowly. But the plan was never to find talent, or start a band, or host a jam. There was no plan, beyond sitting, strumming, having a beer. It was a lesson I learned from the Irish, who treat Sunday as a rightful part of the weekend, not a day to prepare for Monday. Sunday is still your time, not work’s. Worry about work if you wake up. We swapped tunes, played on what we could, and eventually forged a limited little catalog of the Head and the Heart, Tom Petty, Of Monsters and Men, Old Crow Medicine Show, the Avett Brothers, Dylan, Springsteen, Johnny Cash, Edward Sharpe, Bon Iver, Vance Joy—but the Lumineers were our most frequent, and our most favorite. It was the middle of the Venn Diagram of our eclectic tastes, and the line of demarcation in the Houlignas songbook. We’d play “Ho Hey,” “Flowers in Your Hair,” “Stubborn Love,” “Gale’s Song,” “Falling”—songs with shouts and foot stomps and shared choruses, which suited us and the background. It suited the scene. Before we knew Old John was a drummer—when he was just the guy in the corner—we played “Submarines,” and I stood on top of the cajon and stomped down on it, recklessly searching for a sound to match Zack’s banjo punch, as John looked on in horror. We bought foot tambourines and pounded on guitar cases, clapped our hands, slapped the bar—tried to make something out of nothing, searching for a rustic heartbeat. 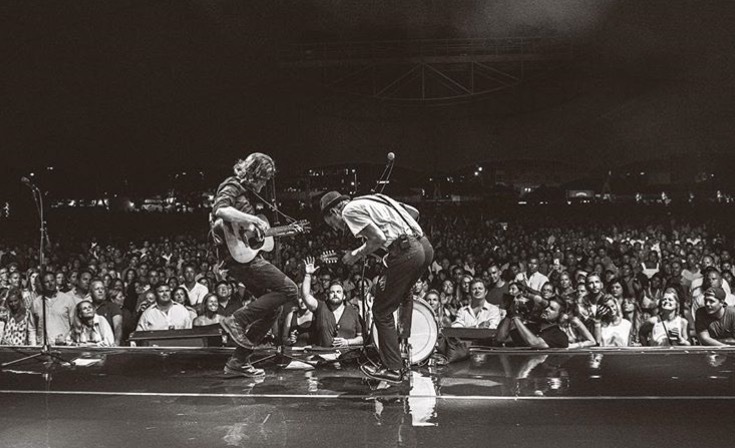 Despite the little justice we gave those songs, the Lumineers became the soundtrack to nights that feel like they never ended, only paused to be picked up again a week later, like removing a bookmark from a well-worn paperback. But Houligans wasn’t a musical place—nowhere in Wilbraham, Massachusetts is, and we weren’t good enough to be the first. Houligans was a gathering place, and whatever magic was in those nights extended beyond the “jam,” because of the people that didn’t play: it’s where I reconnected with Greener, and it seems illogical now that there was ever a time we didn’t hang out; Tim was there the first Sunday, when Zack and I stumbled upon a ukulele, there the majority of Sundays that followed, rapping same “Same Love” off-key when prompted, holding court at the corner of the bar; Ben was our boisterous glue, with Keno slips papering the area in front of him, an insistent smile and a charisma that reached beyond our circle, as he’d introduce himself to the few people we didn’t know with an endearing clumsiness. If old friends were in town, they’d stop by; if we made new friends, they were welcomed back; if anyone needed us, they knew where to find us after Sunday at 7, and there was a charm in something you could count on like that. Then, with a steadier pace than it all began, it eroded. Changed keys. Old John caught a cold—long winter, he said, then more or less vanished; Tim got a job in Boston, putting an end to the final stretch when I saw my best friend on a daily basis; Ben found a new hangout, Dave moved to California; Omari still comes occasionally, but lost time to a girlfriend and stand-up comedy; Richie got married, bought a house; Val had a baby. I still go, every Sunday, like its church: I pull into the same parking spot just beyond the patio, taking my guitar from the trunk, and living momentarily in the freshness of cooling Sunday night air. I cross the familiar pavement into the same door, and am met by a newer, objectively nicer venue, the smell of lacquer having only recently faded after the renovation. The first football season after the switch to the Daily Pint, we were kept out, but that only lasted a few months, as Sunday night games, curious patrons, and a renewed ownership faded. Sundays returned to their sleepy, infrequent crowds—even smaller now that the band has been downsized by circumstance. The ceilings have been comfortably raised, now showing exposed beams, light, glossy wood, and clean lines. There are new windows, new TVs, a logically-sized kitchen that opened more seats, a “no dogs” policy, and a new jukebox, which makes us wait until its funds run dry. I’m not allowed behind the bar anymore—there are cameras now—and the menu has grown into an actual menu, with specialty pizzas, sandwiches, and wings. They’re all surprisingly good, and can draw a little crowd, but per Zack’s request, the kitchen closes at 7 on Sundays: he got into the business to play banjo, not sling pub grub, and that tradition predates the menu. And he needs to be available for those nights—less frequent now, but still possible—that feel like they’ll never end, only be paused. I need him available for those nights. When we shout, and stomp our feet, and return to the songs we put under our fingers when we were kings. When we sing the words we didn’t write, but lived in back then—and still do, when we’re lucky enough.